This is my recipe for the holiday season. Ive always loved a nice butter rum/ butterscotch drink. With the holidays creeping up on us i knew exactly what i needed to do. This profile is reminiscent of a holiday, spiked, butter rum eggnog. 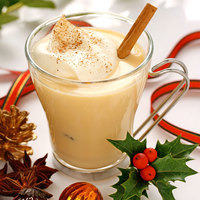 With wonderful bourbon and butter rum boozy notes mixed wonderfully with the creamy dulce de leche and the sweet decadent spice of a tasty holiday eggnog. This recipe is the property of Dezy and released under the CC Attribution-NonCommercial-Sharealike 4.0 license. You may not copy, derive or commercialize this recipe without following the terms of this license or the explicit permission of the creator. Nice boozy holiday vape. Thanks for sharing!